Every day we are reminded to appreciate our loved ones as well as valued members of our community, especially our senior citizens. This year, the Culinary Club and the Interact Club partnered together for a community service project to show some love to the senior citizens of North Arlington. The Culinary Club and Advisor Mrs. Antosek started the project by baking 60 sugar cookies from scratch, rolling some in festive red sprinkles. The Interact club then hand-designed gift bags for the seniors with useful items like tissues and notepads inside. 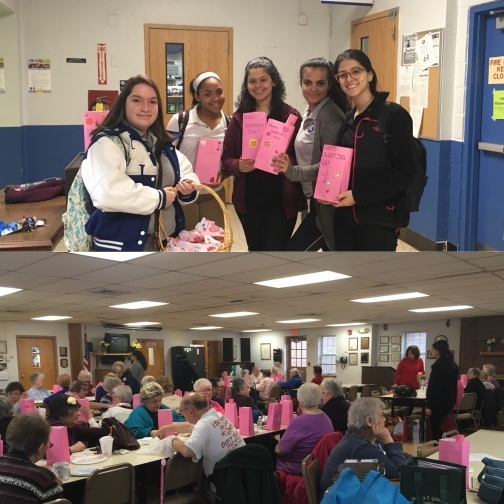 The cookies were then placed inside the gift bags and representatives from each club visited the senior center next to the library with Mrs. Gagliano to deliver the sweet treats. All of the senior citizens were very thankful for the treats and the smiles on their faces made all of the hard work worth it. It is important to remember our senior citizens and thank them for being a part of our community, and what better way than with cookies and gift bags! It goes to show, it only takes one act of kindness to brighten someone’s life, so when the opportunity is there, take it! Both the Interact Club and the Culinary Club engage in community service projects throughout the year, and students are encouraged to help out when they can to make a difference in the lives of others. Thank you to Mrs. Antosek, Mrs. Gagliano, and our school administration for organizing this project; and good job to the Culinary and Interact clubs for their dedication and efforts!